How do eating establishments make most of their revenue? Through psychological techniques, mainly. All kidding aside, table tent sign holders happen to be the heavy hitters when it comes to maximizing a restaurant's profit margins. Whether at a bar during happy hour or seated in a cafe or bistro, the first thing hungry patrons typically reach for are these little advertising displays offering appetizers and/or drink specials. Table tent sign holders are designed to entice and upsell with the end goal of building a higher average check per patron. 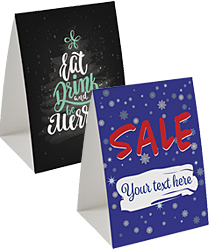 Available in lots of sizes and styles at low prices, this affordable tabletop signage extends the reach of every restaurant's marketing strategy. 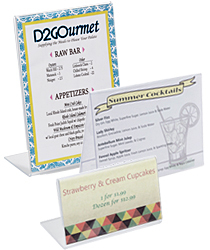 We sell the tools to build your business; you provide the menu cards that display inside them. 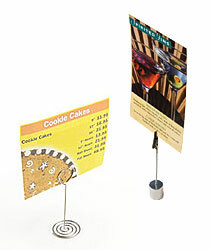 What kinds of menu card displays do we offer? 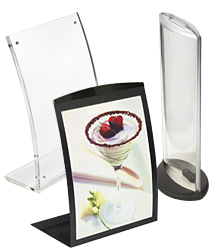 Table tent sign holders come in a wide variety for the restaurateur. Flip Charts provide a compact and space-saving way to display a large number of printed menu cards. Each stand supports up to 10 individual plastic sleeves which attach to the top ring. Customers are drawn to these types of holders and enjoy the process of flipping through your offerings. Leatherette Table Tents share the same design and construction as the traditional hard covers that hold the actual restaurant's menu. These models feature black borders that frame the printed insert behind clear plastic lenses. 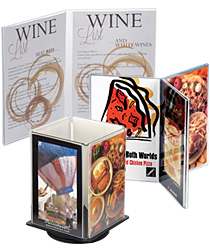 Both affordable and attractive, these table top leatherette displays are excellent choices for upscale eateries. Single-Panel Holders are the easy choice for many establishments, and our selection is deep. Sizes are available in most of the standard graphics sizes (e.g. 4" x 9", 5" x 7") for displaying one card. 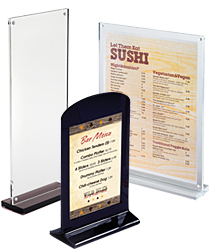 Shop frames made from clear acrylic, wood, or extruded aluminum to help push your food and drink specials. 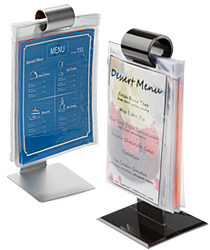 Multi-Panel Signs take it a step further by displaying anywhere from two to eight menu cards. 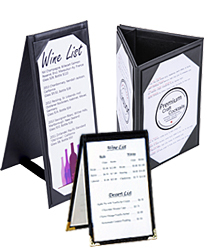 Not only can you offer patrons mouth-watering appetizers and seasonal drinks, you can also use the extra panels to advertise your restaurant by inserting your establishment's history, owner's message, or a story about how the business started. Personalizing the customer's experience simply adds to their overall enjoyment and review of your eatery. Cheap Table Tents feature our lowest-priced table signs with many available in the traditional "tent" style. Most models are manufactured by our very own in-house division, called The Workshop. Merchandising displays don't have to be expensive, so we are committed to providing restaurant owners with quality tools to build their business. Buy table top sign frames in bulk and receive discounted volume pricing! Curved Sign Holders, which come in concave or convex versions, are excellent choices for the upscale eatery. 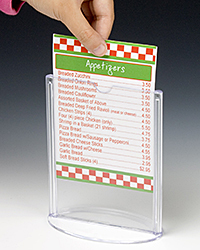 Acrylic models feature a sandwich-style design, where your printed insert is held in place between two plates with embedded magnets at the corners. Steel styles feature magnetic flip-up lenses with black borders that effectively frame your menu offerings most handsomely. Table Number Holders perform the task of designating tables and/or place settings. These are designed for restaurants that bring out your food to your table after ordering, or catering companies that outfit wedding receptions, large banquets, and other parties. We have a good variety of small chrome steel clip holders as well as taller stands that make it easier for guests and waitstaff to see the number. 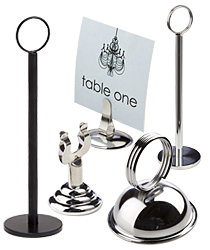 Rounding out the collection is the Wire Clip Place Card Stands category. Offering fun shapes and colors, these little stands are perfect for wedding or party favors. We sell them in bulk sets with individual pieces hovering below the $1 mark! Restaurants are in the business of making money within the confines of traditionally low margins. Whatever tools they have at that their disposal will be used indefinitely. 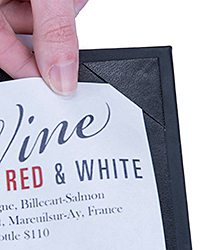 These tabletop signage displays are revenue-boosting advertisers every eatery shouldn't be without. Not only do they provide a place for upselling drinks and food specials, they work in tandem with the table menus and restaurant menu boards also seen listing your offerings.